EPIC Lecture Series 2017 presentations and videos available! 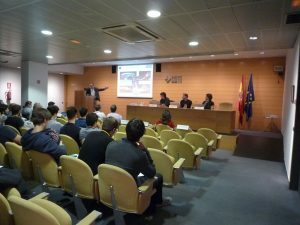 The EPIC Lecture Series 2017 was organized by the EPIC PSA and the University Carlos III of Madrid (UC3M), and held on 26 October 2017 in Madrid, at: CDTI (Madrid), Spain; and took advantage of the presence of several prominent universities imparting engineering, and particularly aerospace engineering, in the Madrid region. 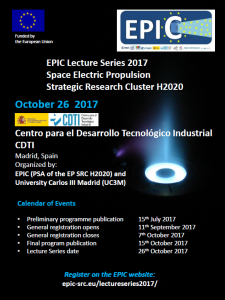 The EPIC Lecture Series is an educational activity of the EPIC PSA under the Horizon 2020 electric propulsion SRC funded by the European Union. EPIC PSA aims also to organize educational events, trainings and Lecture Series on the subject in coordination with ESA and national agencies educational programmes and resources. These educational events and material are envisaged as a suitable vehicle to promote the interest on electric propulsion and space science and technology, among science and engineering students. The EPIC Lecture Series main objective is to provide to science and engineering university students (bachelor, master, PhD) with a selection of lectures on space electric propulsion, from the basic technology and concepts to the latest developments, with the aim to promote space EP talent and interest at university educational level, and therefore prepare the new generation of electric propulsion professionals. The EPIC Lecture Series covers subjects ranging from electric propulsion principles and main technologies, present and future missions using electric propulsion, current technological challenges, relevant thruster subsystems, modeling and computational tools, experimental facilities and measurement techniques in the laboratory. José GONZÁLEZ DEL AMO, ESA: Electric propulsion in space missions. Vincent JACOD, AIRBUS DS: All-electric-propulsion satellites on GEO telecom market. Javier PALENCIA, CRISA: Electronics for electric propulsion. Luis CONDE, ETSIA – UPM: Multiprobe plasma flow diagnostics for space propulsion. Jaime PEREZ LUNA, QINETIQ Ltd.: Gridded Ion Engines. Eduardo AHEDO, UC3M: Hall Effect Thrusters. Denis PACKAN, ONERA: RF thruster in electric propulsion: principle and diagnostics. Mario MERINO, UC3M: Magnetic nozzles for electric propulsion. The EPIC PSA project will organize next EPIC Lecture Series in conjunction with future EPIC Workshops (in London on 2018 and in ESTEC on 2019). The target audience for the EPIC Lecture Series is the university students from Europe, although a higher participation is expected from local universities.